This article shall consider the structure of the filtration barrier, filtration and relevant clinical conditions. The glomerular capillary endothelium has many perforations called fenestrae which are pores about 70nm in size. These pores actually do not restrict the movement of water and proteins or large molecules but instead is thought to limit the filtration of cellular components (eg: RBCs). Surrounding the luminal surface of the endothelial cells is glycocalyx consisting of negatively charged glycosaminoglycans which function to hinder the diffusion of negatively charged molecules. The basement membrane is found surrounding the endothelium and is mostly made up of collagen type IV, heparan sulfate proteoglycans and lamina. The heparan sulfate proteoglycans actually function to restrict the movement of negatively charged molecules across the basement membrane. These layers help to limit the filtration of intermediate to large sized solutes. Podocytes are the specialised epithelial cells of Bowman’s capsule which form the visceral layer of the capsule. Foot-like processes project from these podocytes and interdigitate to form filtration slits. These filtration slits are bridged by a thin diaphgram (the slit diaphragm) which has very small pores preventing large molecules from crossing. Similar to the glycocalyx around the endothelial cells, negatively charged glycoproteins cover the podocytes, restricting filtration of large anions. 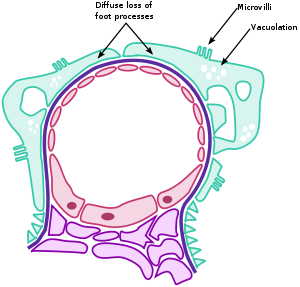 Fig 1 – Diagram showing the structure and histology of the glomerulus. The filtration rate of molecules of the same charge across the filtration barrier is inversely related to their molecular weight. Small molecules like glucose (180 Da) are freely filtered whereas albumin (69 kDa) is barely able to cross the barrier. The charge also plays a role in affecting the filtration rate of the molecule. Negatively charged large molecules are filtered less easily than positively charged ones of the same size. Minimal change disease is responsible for 10%-25% of cases of nephrotic syndrome. Nephrotic syndrome is a triad of symptoms: proteinuria, hypoalbuminemia and oedema. In minimal change disease, the glomeruli appear normal under a light microscope but under an electron microscope, the pathology of the podocytes can be detected. There is diffuse effacement of the foot processes of podocytes (causing the widening of filtration slits) and microvillous change seen on the podocytes. The pathology is still uncertain and considered idiopathic but it is thought to be due to a T-cell-derived factor. Most patients respond well to steroids but the symptoms may relapse if the patient comes off steroid therapy. Some patients become steroid dependant but most do not progress to chronic renal failure and those that do usually have focal segmental glomerulosclerosis as well. Fig 2 – Diagram showing the main pathologies found within minimal change glomerulonephritis. Alport Syndrome is a genetic disease characterised by progressive chronic kidney disease with symptoms of haematuria, sensorineural deafness and ocular abnormalities. In majority of the patients, the inheritance is X-linked with mutations of the gene coding for α5 chain of type IV collagen. This results in thinning of the lamina densa of the glomerular basement membrane, with areas of multi-layering producing a basket weave appearance. In later stages of the disease, glomerulosclerosis, interstitial fibrosis and tubular atrophy occur. There is no definitive treatment for Alport syndrome but ACE Inhibitors are given to reduce proteinuria and progression of renal disease as well as to control hypertension. Which of these is normally blocked by fenestrations in the glomerular capillaries? Which type of collagen is found in the glomerular basement membrane? Which of these features of epithelial cells would not aid in filtering Cl- ions? Which of these is disrupted in Minimal Change Glomerulonephritis?